We're more than half way through the rehearsal process and the Christmas spirit has truly embraced us all. 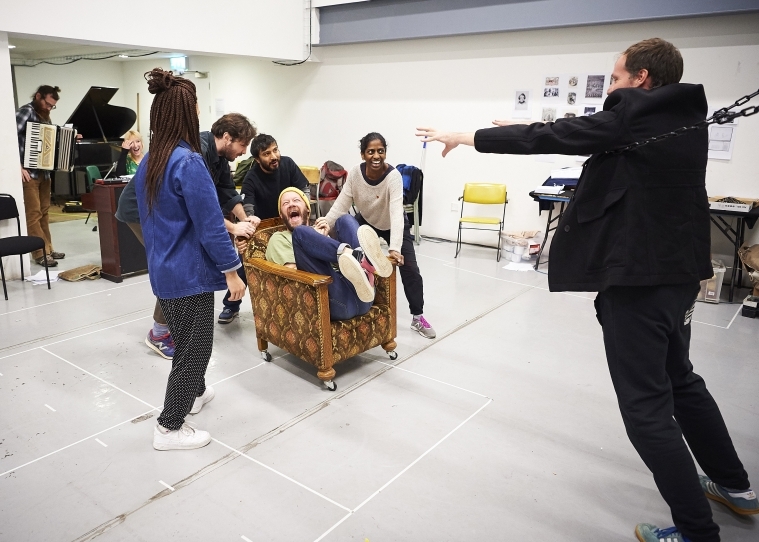 As we eagerly await previews in just two weeks time, discover the latest from A Christmas Carol rehearsals here! We enter our fourth week of rehearsals after an intense third week where plenty of new material has been created. During the past week, new songs have been learnt and new scenes have been approached, while the staging of the first scenes of the play has been revisited. Despite being a week of efficient work, this week has had a slightly fragmented feel to it with many different exciting things happening in a short period of time. Costumes needed to be tried on, interviews were filmed by the marketing department and creative consultants visited to share their expertise on specific parts of the production. Together with Tobi Poster, the cast returned to work on the moments of puppetry that form part of the play. As I don’t want to spoil the surprise I won’t reveal in which parts of the story puppetry appears, but I can say that it will be magical! Speaking of magic, the rehearsal room was also visited by magician duo Morgan & West who looked at technical solutions for the kind of problems that appear when a story with supernatural elements is going to be staged. One of the great perks so far of being part of this process is to see how all these different theatrical expressions come together so well in the piece and create a natural fluidity between the supernatural and realistic elements of the story. After all of this work there is a sense that this past week has solidified not only the language of the play but also the method and pace of work in this particular rehearsal room. This leaves us in a good place to start the week with the Ghost of Christmas Past showing Scrooge the Fezziwigs and their grand Christmas office party, as well as how a young Scrooge (George Readshaw) met and eventually lost his great love Belle (Crystal Condie). There is therefore no doubt that we have an exciting, and quite possibly heart-breaking, week ahead of us! A Christmas Carol draws a festive end to our radical Year of Change. To book tickets or to find out more, visit the show page here.